First I’d like to thank The Older Brother for taking over the Fat Head chair while I was in Washington, D.C. (You’ll be hearing from him again in May when I’m on the low-carb cruise.) I received a record number of emails about Harvard’s latest “Meat Kills!” study just before I left town, so I was pleased The Older Brother gave it a worthy whack and pointed readers to Denise Minger’s slice-and-dice. Gary Taubes also took the study apart and made the remaining points I would have made (and then some), so I won’t bother weighing in on that one. Bottom line: it’s another worthless observational study. Enjoy your steak and burgers. The good news is that I received some very positive feedback from the five people who saw it. The bad news is that five people saw it. (I’m not counting Dr. Richard Feinman or Dr. Wendy Pogozelski, who were presenters in our group.) So it wasn’t exactly my version of Mr. Smith Goes to Washington. I spent hours writing the speech, more hours making slides, still more hours memorizing (I can’t stand reading a speech from a script), had myself all geared up to handle any hostile questions afterwards, flew 650 miles to do battle, and ended up talking mostly to empty chairs. It felt a bit like training for a fight and then stepping into the ring, only to find the opposing fighter’s corner empty. Nonetheless, here’s the speech. In the first half-hour after I posted it to YouTube, more people had already seen it online than saw it in person. The Office of Research Integrity conference (titled Quest for Research Excellence) wasn’t a nutrition conference; it was conference dealing with research issues in a number of disciplines, with multiple presentations being delivered simultaneously. Apparently nutrition wasn’t the hot topic among the attendees. Too bad. In Dr. Feinman’s presentations, he offered several examples of research that was definitely not excellent. Dr. Wendy Pogozelski, a colleague of Dr. Feinman’s at State University of New York, also gave an interesting presentation about childhood obesity and how the current dietary guidelines aren’t helping (to put it mildly). Aside from their presentations, the second-most interesting part of the whole trip for me was standing in line at Reagan International airport in front of two older women with the thickest New Jersey accents I’ve ever heard. They had just dropped off a rental cah and were heading back to Joysey. Either one of them (going by voice, at least) could have been Bugs Bunny’s grandmother. I kept wanting to turn around and ask if they made a wrong toyn at Albukoyke. The most interesting part of the trip was finding myself in a bit of mini-debate with Dr. Feinman over dinner on Thursday night. We’re both convinced people are getting sick and dying younger than necessary thanks to lousy dietary advice from the USDA and other organizations that promote the usual low-fat nonsense. He believes we need to focus on convincing the federal government to re-evaluate the science and, by extension, the dietary advice. I believe the USDA is basically a division of Monsanto, Cargill and ADM, and always will be. I don’t expect the federal government to ever stop promoting a high-carbohydrate diet based on wheat and other grains, so my goal is to convince people to stop listening to the USDA. One of us is right. So perhaps the only logical strategy is to wage this war on both fronts. That was the point of going to Washington to pick a fight. I hope it’s more of a fight next time. Loved the speech, Tom. Smart and funny and engaging. The Wisdom of Crowds connection is brilliant. I thought your speech was fantastic, and it’s always wonderful to hear you talk. I hope there were a few good take-aways in the room, and people are beginning to understand why we’re refusing to listen to our doctors anymore. I haven’t been to the doctor for anything but a sprained ankle in….a long time! They’ve proven to me for years and years that it’s just not worth it. There’s a very good chance of a Fat head book. It’s on our to-do list. 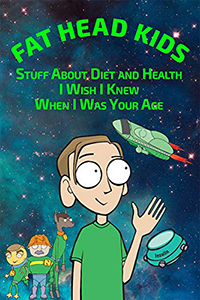 It will be directed at parents and kids, with lots of cartoon-type explanations of the science, as in Fat Head. my wife and I watched this within minute of it being on youtube, the speech was great and i shared it on my FB as soon as i had watched it. Finally watched your Washington DC program – with my dial-up, it took over 3 hours. 🙂 I love hearing you speak. And your program was very well organized and interesting. I’m glad the program is now out on the internet where you’ll actually have an audience. When all is said and done, you might reach more people this way than if you’d had a huge audience at the original event. Congratulations. Three hours? Was I speaking very slowly? Great speech, Tom. It’s a small triumph that you even got to be able to get to that conference at all, regardless of the number of people in the crowd. One thing, for a mere five people, they did laugh at the jokes and there was a fairly loud applause at the end. I do have some concerns, however. First and foremost based on my own experiences on the internet; While getting the message out about low-carb and Paleo is important, I think it it behooves us to be careful that we don’t fall into the same dogmatic, borderline religious trap that has plagued the vegetarian/vegan community as well as those in the low-fat, high-carb camps. Your speech touched on why the older forms of media failed to work, prompting folks to seek out help on the internet, which is all well and good, however I have seen plenty of times where the same issues you describe also infect internet communities. For example, the Eat Right for Your Blood Type diet and the Candida Diet are based around getting people to eat Paleo-like diets, but use horribly scientifically unsound gimmicks to push that through, and even make gobs of cash in the process off of those suffering from the effects of modern SAD. The Curezone community tends to come to mind on this one, especially with other quack nonsense they promote, like the late Hulda Clark’s parasite zapper as a cancer and HIV/AIDS cure. So I’m all for Paleo as you know and the internet is a powerful, but I don’t want us slipping into the elitist mode of our enemies, either, especially if our proverbial house is not in order. Oh, was there a Q&A session after your speech? I agree we need to stay open-minded and go where the (honest) research takes us. There were a few comments afterwards, mostly people giving examples of the Wisdom of Crowds phenomenon. No, you spoke normally — for a couple of seconds, then stopped. Then I had to wait about 20 seconds for the next bit to load. Generally, I don’t bother with videos that are more than a minute or two in length, but I wanted to hear what you had to say. I did decide after about an hour that I could skip the visuals and leave the sound turned up while I did some other work. Thank you for this fabulous talk! You did good, Tom! When will you give your presentation on statins? Governmental bureaucrats love statins and high carbohydrates diets. If I gave that one, I’d start looking over my shoulder for men in dark suits and sunglasses. Awesome presentation Tom. Thank you for all of your hard work! Don’t worry about your small immediate audience, you will, I am sure go large on the new fangled inter web of which you speak.LOL. Slides looked good by the way. Also the more fronts battles are fought on the better, even if a bit frustrating. Sometimes you only have to get through to one person to open up a crack in the armour of nonsense beliefs. In the age of the internet, no speech is wasted, even if the room is empty. That’s why there’s YouTube. Tom, your speech was perfectly polished and most importantly the truth! I am a Tennessee girl, grandmother of 11 and a follower of the Paleo/lowcarb way of eating. I was very familiar with all the websites pictured as well as the wonderful advice you promote. I have a medical background but “educated myself” over three years ago following the sites and blogs of those you mentioned. My inspiration for improving my health was a slightly increased FBS that I was determined to learn more about….and that I did in a hurry! I’m happy to report that the FBS went down 37 points and well into the normal range within 3 weeks. I am well fed, energetic and am the same healthy weight I was when I graduated from highschool over 50 yrs. ago. I don’t believe a room full of people could have spread this critically needed message nearly as fast as we can with all the options we have immediately at our fingertips! Please don’t become weary at the task before you…..our health depends on it. You have thousands of cheerleaders! Go Tom! I appreciate that, and I’m nowhere close to being weary. Not while kids are becoming type 2 diabetics. Great Speech!!! Thanks for all the hard work you do in bringing the fight to D.C.! I still believe with you that our ultimate goal should be to make the USDA irrelevant! Our LCHF movement continues to grow, and the only way people find us is by failing while following the conventional wisdom. The tide is turning….Thanks again for helping lead the charge! We’ll keep hitting them from all directions. The lousy advice from the USDA can’t stand up forever. Preach Tom! Thank you so much for all of your efforts. They do not go unnoticed. It was so good to hear this speech after today especially. Our work hired a nutritionist to come in and of course she spouted the same conventional wisdom we all know is bunk. She even made it a point to talk about how “low carb diets aren’t sustainable” and that there’s no debating the “fact that our body prefers carbs for fuel.” Some other points she was sure to make were that she felt low-fat chocolate milk was a great way to refuel after a workout and that popcorn was a great whole grain snack. It was all I could do to keep my mouth shut (but I wanted the “wellness points” my company offers for attending this little shindig) and not start a debate with her right then and there. AUUUUUUUUGHHHHHHHHHHHH!!! Low-fat chocolate milk is a great way to refuel after a workout, popcorn is a great snack. And that, folks, is why we have record rates of type 2 diabetes. They say the same diet that corrects weight, lipids, digestive problems, tooth decay, diabetes, and so on will kill us. It WILL kill us–of old age. I hope that’s how it turns out. Now and then and I’m in danger of dying from prolonged head-banging incidents. Thank all heavens for a still relatively free internet. Thanks to blogs like yours I have dropped 54 pounds and resolved health issues I didn´t even know were food related; like my dry skin, flaky nails, my severe depressions every winter, my endless tierdness (woke up tired – been like a smiling rubberball since going low-carb), my knee pains (I thought it was the weight, turns out I get them back if I eat wheat..). I thought it was my age creepeng up on me (I´m 46) but I haven´t gotten any younger this past year, just waaaaay healthier (and better looking, haha). Thank you for beeing a beacon of sense out there! I hear you. I tried low-carb mostly to lose weight, then was pleasantly surprised at how many nagging health issues went away. I attribute most of the health improvements to giving up grains; I wasn’t a sugar-eater even before I went low-carb. Like Elena, I also hit my lowest point at 46 yo and my doctor told me it was a natural thing to feel worse with age. I am 51 now and feel much better than probably at 35, because on a LC diet I have an unlimited and stable energy, stopped having seasonal flus at all, urinary tract infections, yest infections, PMS, swollen legs, hot flashes, uncontrollable hunger, painful hand joints. My migraines are 90% better now, I look much younger than my age, face is not puffy any longer, I am still without wrinkles. The only one negative – I am a LC maniac now who unreasonably believes that LC diet cures everything and skeptical about pharmacological options..
Just so I don’t mislead anyone, I’m going on record as stating that a low-carb diet will not cure a broken leg. But it’s good for a lot of other ailments. I just want to say thank you for making this documentary. I have tried every diet known to man and nothing has made as much sense as this. I have been doing Mixed Martial Arts for years and have been doing what would be considered a Pritikin like diet since my first fight. I have been depressed and unable to function from the moment I began the diet. I constantly deal with pain in the joints and what I like to call, brain fog. I was also diagnosed with hyper inflammation in the lower extremities by my doctor after a battery of test to find out why I’m always so tired. Approximately a year and a half ago I suffered a muscle strain in my psoas major. It never healed as a result of the constant inflammation. I tried several omega 6 ” anti-inflammatory diets” which only made things worse after a short placebo period of relief. I was becoming more depressed and was now unable to compete or even train. I happened across the documentary about two weeks ago. That day I went out and got a fat laced burger and took the plunge, and I haven’t looked back! My inflammation stopped the very next day, no more stiffness, no more brain fog, and most of all I was happy again. It has continued to this day and I have been passing on the word, forcing friends to watch Fathead. Many of them reject the idea at first but they see my fervor and decide to give it a try. So I just want to say thanks. To put it simply, if this whole diet is a sham and I die in five years from a massive heart attack I would still be better off then living a hundred more years depressed and in pain! Five years? Naw … this diet will kill you sometime around age 100. Very good speech, perfect in my opinion. It’s a shame so few people were there to hear it first-hand. Too bad for them. You are doing a great job, Tom, keep it up! You have helped a lot of people. I am sorry, I meant to write “too bad for those who could have been there, but didn’t bother”. Anyway, the Internet is a great place to find information and support. Your speech will not go unheard, that’s for sure. It’s already up around 4,000 views. I don’t feel the effort was wasted by any means. 3: Go to work (or other activity). 4: Come back some hours later and watch the pre-loaded video whilst drinking a coffee (and probably eating some pork rinds). I love your speech. I think what I enjoy the most is that you can maintain a good sense of humor. Since all of the research in the world can’t stop bad govenrment advice, you must learn to laugh while beating your head against a wall. I agree completely that the USDA has no business in handing out dietary advice since it will always have a conflict of interest there. I don’t know why people think the govenment is an appropriate avenue for health advice..no one trusts politicians but we trust them for diet/health advice…??? If we lose our sense of humor, they win. They don’t show up until I approve them. Thank you so much for all of the information. I’m headed to Netflix to watch the movie right now! Thanks, TonyNZ. I’ll see what I can figure out. Yes Tom, I understand awaiting approval. I have submitted two comments and as soon as I hit the submit button, they are gone forever. That’s strange. I did a quick check of the spam folder and didn’t see anything there with your name on it. I used to check the spam folder all the time, but had to give it up after the site started drawing thousands of spam comments per week. Even in The Netherlands you are being watched. Keep it up and make us healthy again. I loved your speech and especially the part where you connected it to the wisdom of the crowd. You really took the edge of the “scary part” with “normal” people giving health advice. Thank you for the time you put into preparing this. 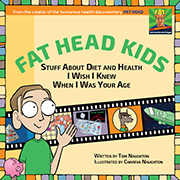 Aim the Fathead book at children and perhaps even the doctors (and even nutritionists) will understand. Great video. Almost 5k views, so honestly your initial viewing audience does not matter any longer! You had me laughing out lout a few times. Keep up the fight. If it was a thick jersey accent, there were from the NYC, North Jersey is not New Jersey which have counties below the Mason-Dixon line. Great speech! I know a few medical professionals that must watch this because they think they know everything about nutrition because they studied it in school. Well I study nutrition blogs everyday, and I know much more than they do! If you read a couple of books on the topic, you’ve learned more than most doctors. Great speech! Too bad more people didn’t see it in person. Have you lost more weight? You’re looking trimmer. I don’t own a scale, but I’m quite a bit leaner than when I finished making Fat Head. Great speech, Tom. You did an awesome job. It is too bad that you didn’t have a larger crowd to hear it. Thanks for sharing it. I consider myself lucky, because my doctor is completely supportive of low carb/high fat. I recently had bloodwork done and my C-reactive protein was .4 (it used to be between 5.0 and 6.0, when I was eating a lot of carbs). We need more doctors like that. Loved the video! It doesn’t matter if it was only five people in the room. If the message gets to the right ONE it can make all the difference in the world. PS – I think you should give The Older Brother his own login ID so he can quit using yours. I’ve tried without success to figure out that second login thing. I don’t much like fussing with WordPress. I would have felt so disheartened by only seeing five people in the room, but the youtube video is sure getting a lot of hits. Thanks for making it easy for us in the crowd to share information! We’re up to 8,000 views already and counting, so it certainly wasn’t a wasted effort. You may not be aware of it but people are reading your posts and listening to you enthusiastically in FRANCE. Thank you Tom, for being so informative AND funny! I’m delighted to hear that, thanks. O’ Man – Tom, that is just brutal. I laughed so hard at your “Can you say Moose & Squirrel?” joke in the movie Fat Head my eyes watered up. And now I read about you walking out to a group of five people and once again my eyes water up thinking about how difficult that must have been. You’re an interesting man Tom. I am so enjoying reading your blog and learning about you and your life. Life can be frustrating, but it’s rarely dull.